How Risky Is Clean Energy Fuels Corp.? The stock looks like a relative bargain, but a closer look is warranted. Shares of natural gas transportation fuels leader Clean Energy Fuels (NASDAQ:CLNE) have lost 42% of their value since September 2016. In fact, the stock is threatening its 52-week -- and all-time -- low of just $2.15 per share. Then again, you're always told to buy low. 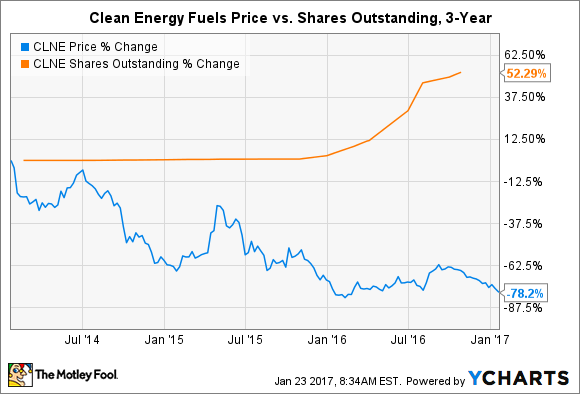 Investors wondering if now is a good time to buy should answer another question first: How risky is Clean Energy Fuels? The company has several attractive attributes. Sales volumes have grown like clockwork in recent years. In the first nine months of last year, Clean Energy Fuels sold 245 million gasoline gallon equivalents, or GGE, compared to 230 million GGE in the year-ago period. That's a remarkable change from 2013, when only 214 million GGE were sold for the entire year. The market potential is large and the market is largely untapped -- something the company has been able to exploit. Despite increasing volumes of product sold, depressed selling prices have taken a toll on revenue. Full-year revenue slipped in 2015 compared to the prior year. And although 2016 revenue will likely be higher than the previous year, it will be unlikely to match the watermark set in 2014. But management is banking on a turnaround. It slashed capital expenditures last year to help boost the bottom line to a net loss of just $0.07 per share through the first nine months, much improved from a net loss of $0.92 per share in the year-ago period. It also cleaned up the balance sheet by retiring debt with proceeds from a share offering. Dilution, perhaps more so than market conditions, has played a major role in the stock's dismal performance in the last several years. 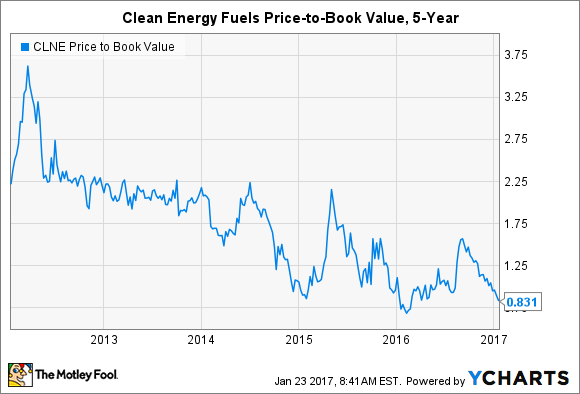 The recently sliding stock price means Clean Energy Fuels is historically cheap on the basis of price-to-book value. Investors could rarely pick up shares without paying a premium for growth, but can now enjoy a 17% discount to shareholders' equity. CLNE Price to Book Value data by YCharts. Of course, heavy dilution and years of sacrificing profits for growth can erode Mr. Market's faith in a stock. So how does Clean Energy Fuels compare to publicly traded peers? 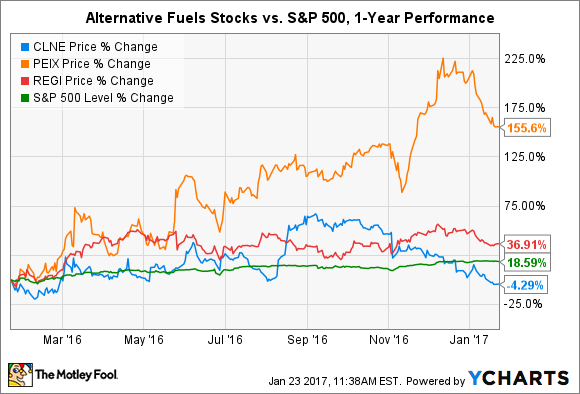 Admittedly, there aren't many direct comparisons, but we can stack the company up against other alternative fuel stocks that have had a similarly rough going since commodity prices tanked in late 2014. All three companies trade below book value, with Clean Energy Fuels presenting a decent bargain. This hints that investors could see upside from current prices, barring a sudden decrease in assets or increase in debt. However, investors need to consider that money-burning operations mean the company's cash could disappear in several quarters -- dragging down the total asset balance. The only way for the company to get its hands on more cash is through a debt or share offering, which has gotten investors into the current mess. Clean Energy Fuels is also the most expensive company of the three based on price-to-sales ratio, although that shouldn't be too surprising given that it has grown revenue the fastest and growth usually comes at a premium. Plus, the other two stocks boast an unusually low ratio. Beta, or the measure of a stock's volatility relative to the overall market, is also the highest for the natural gas transportation fuels leader, but only slightly. Overall, these metrics provide a murky view of Clean Energy Fuels' risk level moving forward. What's telling is that both Renewable Energy Group and Pacific Ethanol have handily beaten the stock market in the past year and should be profitable in 2017, while our stock in question has lagged the market and isn't expected to post profits this year. That, in the end, could say enough about where the stock is headed. While traditional valuation metrics are important, investors also need to keep their eyes on developments in the real world that ultimately influence a stock. For instance, the recent increase in natural gas prices could result in an increase in Clean Energy Fuels' input costs. If the increase in costs isn't offset by an increase in selling prices, then the company could see margins shrink and losses widen. That could lead to a further deterioration of the share price and jeopardize an already fragile balance sheet. Market unknowns, coupled with mediocre financial metrics -- book value is the only positive -- make the stock appear to be relatively risky, and certainly too risky for me.